Vitamin B6 or biotin is essential to the body on so many fronts. Almost any bodily process you can think of requires it. Most people know that you need it to metabolize fats, carbohydrates, and proteins and that it is a great aid if you want glowing skin, shiny and lustrous hair, and strong nails. What most people don’t realize is how important it also is to correct nervous system functioning, rebuilding tissue and muscle and preventing cognitive decline. Biotin 5 is marketed as an aid in supporting healthy skin, hair and nails; healthy lipid metabolism; a healthy pregnancy and hormone synthesis. This is a high dose which is almost 1700% more than the required daily average, and it is for people who urgently need these high doses. The body cannot store biotin. It may be that you are seeking to restore skin, health and nails after a particularly traumatic health scare or health treatment. It is also important if you cannot obtain vitamin B6 from your diet. Take one capsule daily with food or as directed by your healthcare professional. Do not give t children. If you’re pregnant or breastfeeding you should not take this or consult your doctor first. A bottle of 90 capsules costs $12.95 on the product website. This does seem to be the only bottle size and there are no discounts for buying 3 or more bottles. The manufacturer does seem to have a loyalty reward program. There is a wholesale program for resellers. It is slightly more expensive to buy on Amazon. All returns need to be authorized first. This must be done within 30 days; it is unclear if you can return partially used products. Seeking Health explicitly reserves the right to deny returns. Reviews on the website are good but sparse. However, they must be taken somewhat with a pinch of salt because consumers are incentivized to leave reviews in exchange for loyalty points. This taints the impartiality of the reviews. The reviews on Amazon’s feedback page are positive – again, we do not know if these reviews are also incentivized by loyalty points. The manufacturer does have a unique selling point in that this biotin extract is physician formulated. Both vegans and vegetarians can take this product. It contains a high dose which should start to make a difference in three weeks or more that is visible in the form of hair and nail strength and regrowth. 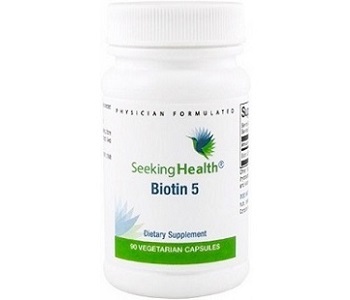 We were somewhat surprised by the implication, as marketed, that Biotin 5 as a benefit could help you with a healthy pregnancy. Yes, vitamin B6 essential for embryonic growth but safety in supplementation form during pregnancy has not yet been established as being totally safe. This is why all supplement makers will actually urge you as a pregnant lady first to clear use with a doctor. We are also not sure to what extent reviews are completely unbiased – solicited and incentivized ones hardly ever are (consumers get loyalty points for reviews). Finally, you want a clear and unequivocal returns policy as you’ll need a while to try this supplement. We suggest looking further – there are singularly one or two manufacturers offering great bulk discounts with solid returns policies and in some cases, the mcg of biotin contained is even higher.